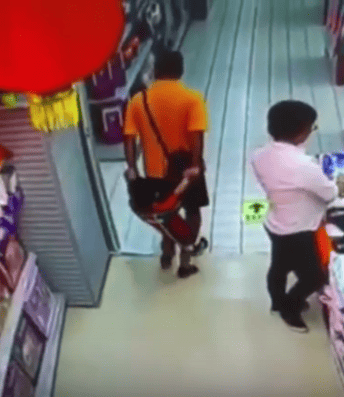 Horrific footage has emerged of a father toppling over onto his son in a supermarket and allegedly crushing him to death. The CCTV video shows the father lovingly holding the boy’s hands behind him before losing his footing and falling backwards onto him, the Mirror reports. The harrowing film, reportedly aired by the Guangzhou Broadcasting Network, appears to show the father falling on the boy’s neck. The man scrambles to his feet while a passing woman rushes to the boy’s aid and lifts him up. Unconfirmed reports suggested the boy died in hospital after suffering a broken neck, but the fate of the boy is not known for sure. The origin of the footage is unknown but it has been widely shared in China to highlight the dangers of everyday life.